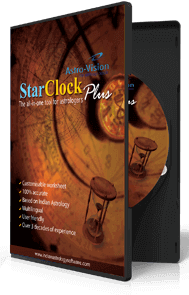 Astro-Vision's Kannada astrology software is a very popular astrology software used by famous Astrologers all over the world for over 25 years. Our Kannada astrology software has a large clientele both in India and abroad. Our Kannada astrology software provides accurate and precise calculations and predictions. 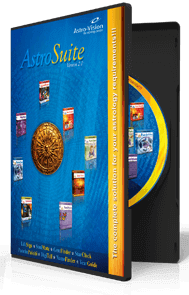 This time-tested astrology software takes care of astrological calculations so you can focus on the astrological analysis. Astro-Vision's Kannada Astrology software has a complete set of calculations required for astrological analysis and astrology consultancy as per Vedic astrology. 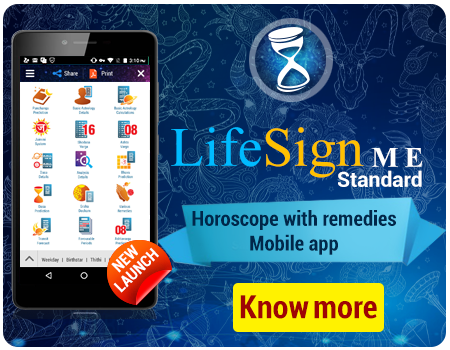 If you are looking for a Kannada astrology software which includes calculations as well as predictions in Kannada, then Astro-Vision LifeSign Kannada Astrology Software with predictions is for you. Various ayanamsa settings are provided, such as Chitra Paksha ayanamsa or Lahiri ayanamsa, Raman ayanamsa, Krishnamurthy ayanamsa, Thirukanitham ayanamsa or Franken ayanamsa and a user defined ayanamsa. These options are especially useful for astrologers and students of astrology interested in Indian astrology research. Comes with a large built-in database of cities from around the world. So you don’t have to spend time entering the latitude, longitude or time zones. An option to add more cities is also available, thus making it fully customisable. Choose from two options for dasa system, one consisting of 365.25 days or the other consisting of 360 days. The Kannada Horoscope software is easy to use and simple. The menu options are easily accessible and the calculation reports are organised in an efficient manner. 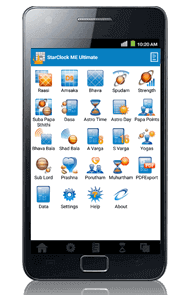 Now Kannada Astrology Software comes with a special offer – the extremely popular Kannada Panchanga Software StarClock VX absolutely FREE! Some of the features of Kannada Panchangam Software are dual language mode i.e., reports can be made in English as well as Kannada; representation of qualities of the planets, astrological qualities of the moment, exact rahu kala, gulika kala, transit times and transit positions and muhurtham software. AstroPack 1.0 Kannada Astrology Software calculates Birth Star (utitha nakshatra ) as well as various astrological properties of the nakshatra and horoscope such as nakshatra pada, Birth rasi and the rasi deva, Lagna Ascendant and the Lagna devam , Thidhi (Lunar day), Dinamana, Astrological Day of birth, Kalidina Sankhya, Nakshatra adipathi, Ganam, Yoni, Animal, Bird, Tree, Chandra Avastha, Chandra Vela, Chandra Kriya, Dagda Rasi, Karanam, Nithyayoga, Rasi of Sun - Star Position, Position of Angadityan, Yogi Point - Yogi Star, Yogi Planet, Duplicate Yogi, Avayogi Star – Planet, Atma Karaka (Soul) – Karakamsa, Amatya Karaka, Lagna Aruda (Pada) / Thanu and Dhana Aruda (Pada). Nirayana longitude of planets, the basis of calculations in the Indian system are derived from the Sayana values. All the charts, calculations and analysis provided in the Kannada horoscope software are based on Vedic Astrology. The nirayana longitude of planets, the rasi, the longitude in the rasi, the nakshatra as well as nakshatra pada is calculated. The Nakshatra, nakshatra adipathi, sub lord as well as sub sub lord is calculated for each planet. A brief summary of the nirayana longitude of the planets is also provided along with the kundali chart and navamsa chart in the Kannada astrology software. The dasa as well as dasa balance at birth is also provided along with the kundali chart and navamsa chart. A special rasi chakra chart is also provided in the Kannada horoscope software, giving details of whether a navamsa or planet is in retrograde motion, or whether it is exalted, debilitated or combust. AstroPack 1.0 Kannada Jyothisha software also provides the bhava chart and the bhava table giving details of the arambha, madhya, anthya and the list of planets located in bhava. Corresponding to each planet, a sub-planet (Upagraha) is calculated in the Kannada horoscope software. The sub planets of Moon, Venus, Mars, Rahu and Ketu are based on the longitude of the Sun and these values are calculated. The dhumadi group of Sub Planets is provided in a table with details of the method of calculation for each of these sub planets. The Upagraha longitudes are also calculated and presented in table format for easy reference. The Nakshatra adipathi / Sub-Lord / Sub-Sub-Lord Charts of Upagrahas are also available. Upagraha rasi chakra is calculated and the Upagaraha rasi chakra is also provided. AstroPack 1.0 Kannada Horoscope software calculates the values corresponding to the aruda chakra chart and prepares the aruda chakra. AstroPack 1.0 Kannada Jyothisha software calculates the values present in the shodasavargha table and prepares the corresponding shodasavargha table. AstroPack 1.0 Horoscope software in Kannada calculates the Lords of the shodasavarga and presents it in chart format for easy reference. AstroPack 1.0 Kannada Horoscope software calculates the vargottama. AstroPack 1.0 Kannada Jyothish software calculates the varga bheda values wherein points are allocated for Swavarga (own house) and Uchavarga (exaltation). The varga bheda table is also prepared. AstroPack 1.0 Kannada Astrology Software prepares various charts after making the necessary calculations such as the rasi chakram, Hora chart, Drekkana chart, Chathurthamsa chart, Saptamsa chart, Navamsa chart, Dasamsa chart, Dwadasamsa chart, Shodasamsa chart, Vimsamsa chart, Chathurvimsamsa chart, Bhamsa chart, Trimsamsa chart, Khavedamsa chart, Akshavedamsa chart and Shashtiamsa chart. Details of the Dasa and Bhukti (Apahara) periods are given with details of the arambha and anthya for each Bhukti (Apahara) within each Dasa period. AstroPack 1.0 Kannada Astrology Software presents the details of the Paryanthardasa within each Bhukti (Apahara) including the arambha and anthya for each Paryanthardasa. 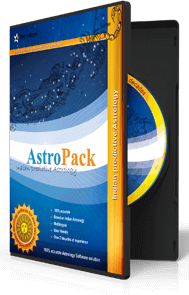 AstroPack 1.0 Kannada Astrology Software calculates the values pertaining to various Ashtakavarga Charts and prepares the various Ashtakavarga Charts such as the Chandra Ashtakavarga chart, Surya Ashtakavarga chart, Budha Ashtakavarga chart, Shukra Ashtakavarga chart, Kuja Ashtakavarga chart, Guru Ashtakavarga chart, Sani Ashtakavarga chart and the Sarva Ashtakavarga chart. Various Ashtakavarga charts after reductions are also prepared and presented in the Kannada Jyothish software. An analysis of the planetary disposition including Lords of Houses, the Bhava lord of each house, Planetary conjunction ( yogam ), Planet to planet aspects, Planet to house aspects, Benefic Planets and Malefic planets and their effects, Friendship Chart , Aspect Strength Chart (Drikbala) in Shashtiamsas, Shadbala Table, Bhava Aspect Strength Chart (Bhava Drikbala) in Shashtiamsas, Bhava Bala Table, Kuda Dosha Check, Moudhyam (combustion), Graha Yuthi (Planetary war) and Grahavastha is presented in AstroPack 1.0 Kannada Astrology Software. A brief summary of Vimshottari Dasa periods is given in the Kannada astrology software. The important combinations which result in a yogam are identified in the horoscope and are listed with a brief mention of the effect it can have. While listing the Yogams, the combinations which resulted in the yogam are also given for easy reference in AstroPack 1.0 Kannada Astrology Software. ಜಗತ್ತಿನಾದ್ಯಂತ ಎಲ್ಲ ಪ್ರಸಿದ್ಧ ಜ್ಯೋತಿಷಿಗಳಿಂದ ಉಪಯೋಗಿಸಲ್ಪಡುತ್ತಿರುವ ಮತ್ತು ಜನಪ್ರೀಯವಾಗಿರುವ ಈ “ಅಸ್ಟ್ರೋ-ವಿಜನ್” (ಜ್ಯೋತಿರ್ದೃಷ್ಟಿ) ತಂತ್ರಾಂಶದ ಕನ್ನಡ ಅವತರಣಿಕೆಯು ಕಳೆದ 25 ವರ್ಷಗಳಿಂದಲೂ ಉಪಯೋಗಿಸಲ್ಪಡುತ್ತಿದೆ. ನಮ್ಮ ಕನ್ನಡ ಜ್ಯೋತಿಷ್ಯ ತಂತ್ರಾಂಶವು ಭಾರತದಲ್ಲಿ ಮತ್ತು ವಿದೇಶಗಳಲ್ಲಿಯೂ ಗ್ರಾಹಕರಿಗೆ ಅನುಕೂಲಕರವಾಗಿದೆ. ನಮ್ಮ ಈ ಕನ್ನಡ ತಂತ್ರಾಂಶವು ಅತ್ಯಂತ ನಿಖರವಾದ ಹಾಗೂ ಅತ್ಯಂತ ಅಮೂಲ್ಯವಾದ ಗಣನ ಕ್ರಮಾಂಕವನ್ನು ಮತ್ತು ಭವಿಷ್ಯ ಜ್ಞಾನವನ್ನು ತಿಳಿಯಲು ಸಹಕಾರಿಯಾಗಿದೆ. ಜ್ಯೋತಿಷ್ಯ ಶಾಸ್ತ್ರದ ಗಣನ ಪದ್ಧತಿಯಲ್ಲಿ ಅತ್ಯಂತ ನಿಖರತೆಯನ್ನು ಕಾಯ್ದುಕೊಳ್ಳುವಲ್ಲಿ ಇದು ಪೂರ್ತಿ ವ್ಯವಸ್ಥೆ ಹೊಂದಿರುತ್ತದೆ. ದೀರ್ಘಾವದಿಯಲ್ಲಿ ಇದು ಸಂಪೂರ್ಣವಾಗಿ ಪರೀಕ್ಷಿಸಲ್ಪಟ್ಟಿದೆ. ಈ ಮೂಲಕ ನೀವು ಜ್ಯೋತಿಷ್ಯ ಶಾಸ್ತ್ರದ ವಿಶ್ಲೇಷನೆ ಮಾಡಬಹುದಾಗಿದೆ. ಈ ಅಸ್ಟ್ರೋ-ವಿಜನ್ ಕನ್ನಡ ಜ್ಯೋತಿಷ್ಯ ಶಾಸ್ತ್ರದ ತಂತ್ರಾಂಶವು, ಜ್ಯೋತಿಷ್ಯ ಶಾಸ್ತ್ರದ ವಿಶ್ಲೇಷಣೆಗಾಗಿ ಹಾಗೂ ಜ್ಯೋತಿಷ್ಯದ ಸಲಹೆಗಾಗಿ, ವೇದದ ಪ್ರಾಮಾಣ್ಯವನ್ನು ಅನುಸರಿಸಿದಂತೆಯೇ ರೂಪಿಸಲ್ಪಟ್ಟಿದೆ. ಒಂದು ವೇಳೆ ನೀವು ಇಂಥ ಗಣನ ಪದ್ಧತಿಯನ್ನು ಹೊಂದಿರುವ ಯಾವುದೇ ತಂತ್ರಾಂಶವೊಂದು ಬೇಕೆಂದು ಬಯಸುತ್ತಿದ್ದಲ್ಲಿ, ಇದೋ, ಅಂತಹ ಎಲ್ಲ ಸವಲತ್ತುಗಳನ್ನು ಒಳಗೊಂಡ –ಅಸ್ಟ್ರೋ-ವಿಜನ್ ಕನ್ನಡ ಜ್ಯೋತಿಷ್ಯ ತಂತ್ರಾಂಶ ಇದೀಗ ನಿಮಗಾಗಿ ಇಲ್ಲಿ ಲಭ್ಯವಿದೆ. ಅಯನಾಂಶಗಳಲ್ಲಿ ಹಲವಾರು ರೀತಿಯ ಗಣನಾ ಪದ್ಧತಿಗಳಿವೆ. ಉದಾಹರಣೆಗೆ- “ಚಿತ್ರಪಕ್ಷ ಅಯನಾಂಶ” ಅಥವಾ “ಲಾಹಿರಿ ಅಯನಾಂಶ”, “ರಾಮನ್ ಅಯನಾಂಶ”, “ಕೃಷ್ಣಮೂರ್ತಿ ಅಯನಾಂಶ”, “ತಿರುಕಂಠಂ ಅಯನಾಂಶ” ಅಥವಾ “ಫ್ರಾಂಕೆನ್ ಅಯನಾಂಶ” ಗಳ ಜೊತೆಗೆ ಸುಲಭವಾಗಿ ಬಳಸುವಂತೆ, ಆಯಾ ಗ್ರಾಹಕರ ಬಯಕೆಗೆ ತಕ್ಕಂತೆ ಗಣಿಸಬಹುದಾದ ಅಯನಾಂಶದ ಪದ್ಧತಿಯನ್ನು ಈ ತಂತ್ರಾಂಶವು ಹೊಂದಿರುತ್ತದೆ. ಇವೆಲ್ಲ ಸವಲತ್ತುಗಳು ಭಾರತೀಯ ಜ್ಯೋತಿಷ್ಯ ಶಾಸ್ತ್ರದ ಅನುಸಾರವಾಗಿ ಭವಿಷ್ಯ ಹೇಳುವ ವೃತ್ತಿಯಲ್ಲಿರುವವರಿಗೆ ಹಾಗೂ ಇದರ ಅಭ್ಯಾಸ ಮಾಡುತ್ತಿರುವ ವಿದ್ಯಾರ್ಥಿಗಳಿಗೆ ಅನುಕೂಲಕರವಾಗಿದೆ. ಅಲ್ಲದೇ ಜ್ಯಾತಿಷ್ಯ ಶಾಸ್ತ್ರದಲ್ಲಿ ಸಂಶೋಧನೆ ಮಾಡುವವರಿಗೂ ಸಹಕಾರಿಯಾಗಿದೆ. ಜಗತ್ತಿನ ಎಲ್ಲ ಪ್ರಮುಖ ನಗರಗಳ ದತ್ತಾಂಶಗಳನ್ನು ನೀವು ಅಕ್ಷಾಂಶ/ರೇಖಾಂಶಾಗಳನ್ನು ಹಾಗೂ ಸೂರ್ಯೋದಯದ ಸಮಯವನ್ನು ಕುರಿತು ಸುಲಭವಾಗಿ ಮಾಹಿತಿ ಪಡೆಯಬಹುದು.ಅದೂ ಅಲ್ಲದೆ ಮತ್ತೂ ಬೇರೆ ಬೇರೆ ನಗರಗಳನ್ನು ಇಲ್ಲಿ ಸೇರಿಸಲು ಅವಕಾಶವಿದೆ. ದಶ ವ್ಯವಸ್ಥೆಯನ್ನು ನಿರ್ಧಿಷ್ಟ ಪಡಿಸುವಲ್ಲಿ ಇಲ್ಲಿ ಎರಡು ರೀತಿಯ ಪದ್ಧತಿಗಳಿವೆ. ಒಂದು ಪದ್ಧತಿಯಲ್ಲಿ 365.25 ದಿನಗಳೆಂದು ಹಾಗೂ ಇನ್ನೊಂದು ವ್ಯವಸ್ಥೆಯಲ್ಲಿ 360 ದಿನಗಳ ರೂಪಣೆ ಇದೆ. ಘಟಿಕಾ/ಘಳಿಗೆ ಪದ್ಧತಿಯಿಂದ ’ತಾಸು’ ಪದ್ಧತಿಗೆ ಸುಲಭವಾಗಿ ಪರಿವರ್ತಿಸಿಕೊಳ್ಳುವ ವ್ಯವಸ್ಥೆಯೂ ಇಲ್ಲಿದೆ. ವ್ಯಕ್ತಿಯ ಭಾವ, ಬಲಗಳನ್ನು ನಿಗದಿಗೊಳಿಸುವಲ್ಲಿ, ಇಲ್ಲಿ ಲಭ್ಯವಿರುವ ಎರಡು ವಿಧಾನಗಳಲ್ಲಿ ನಿಮಗೆ ಅನುಕೂಲಕರವಾದ ವಿಧಾನವನ್ನು ಸುಲಭವಾಗಿ ಆಯ್ಕೆ ಮಾಡಿಕೊಳ್ಳಬಹುದಾಗಿದೆ. ಇದರಲ್ಲಿ ಬುಧನ ಸ್ಥಾನದ ಜೊತೆಗೆ ಇರುವ ಸಂಪರ್ಕ ಹಾಗೂ ಬುಧನು ಜಾತಕನಿಗೆ ಸಹಕಾರಿಯಾಗಿರುವ ಹಂತದ ವಿವರಣೆ ಕೊಡುವ ಪದ್ಧತಿ ಇದೆ. ಈ ಕನ್ನಡ ಜಾತಕ ತಂತ್ರಾಂಶವು ಉಪಯೋಗಿಸಲು ಅತ್ಯಂತ ಸರಳ ಹಾಗೂ ಸುಲಭವಾಗಿದೆ. ಇಲ್ಲಿ ನೀಡಲ್ಪಟ್ಟಿರುವ ಆಯ್ಕೆ ಪಟ್ಟಿಯಲ್ಲಿನ ಹಂತಗಳು ಸುಲಭ ಗ್ರಾಹ್ಯವಾಗುವಂತೆ ರೂಪಿಸಲ್ಪಟ್ಟಿವೆ. ಮತ್ತು ವರದಿಯನ್ನು ಪಡೆಯುವಲ್ಲಿ ಅತ್ಯಂತ ನಿಖರವಾದ ಗಣನಾ ಕ್ರಮದಲ್ಲಿ ಪಡೆಯ ಬಹುದಾಗಿದೆ. ಇದೀಗ ಕನ್ನಡ ಜ್ಯೋತಿಷ್ಯ ಶಾಸ್ತ್ರದ ತಂತ್ರಾಂಶವು ಮತ್ತೊಂದು ಕೊಡುಗೆಯೊಂದಿಗೆ ರೂಪಗೊಳ್ಳುತ್ತಿದೆ. ಅಂದರೆ, ಈಗಾಗಲೇ ಅತ್ಯಂತ ಜನಪ್ರೀಯ ವಾಗಿರುವ “ಸ್ಟಾರ ಕ್ಲಾಕ್ -VX” ವ್ಯವಸ್ಥೆಯನ್ನು ಒಅಳಗೊಂಡ ಕನ್ನಡ ಜ್ಯೋತಿಷ್ಯ ಪಂಚಾಂಗದ ತಂತ್ರಾಂಶಾವನ್ನೂ ಸಂಪೂರ್ಣವಾಗಿ, ಉಚಿತವಾಗಿ ಈ ಮೂಲಕ ಕೊಡಲಾಗುತ್ತಿದೆ!! ಇಲ್ಲಿರುವ ಹಲವು ವಿಶೇಷ ಸವಲತ್ತುಗಳ ಪೈಕಿ, ಮುಖ್ಯವಾದುದೆಂದರೆ, ನೀವು ಇಲ್ಲಿ ಎರಡು ಭಾಷೆಯಲ್ಲಿಯೂ ವಿವರಗಳನ್ನು ಪಡೆಯಬಹುದು. ಅಂದರೆ, ನೀವು ವರದಿಯನ್ನು ಇಂಗ್ಲೀಷ ಅಥವಾ ಕನ್ನಡಭಾಷೆಯಲ್ಲಿ ಪಡೆಯ ಬಹುದು. ಗ್ರಹಗಳ ಸ್ಥಾನ ಮಾನ – ಬಲಾಬಲ – ಅವುಗಳ ಚಲನೆಯ ವಿವರಗಳು- ನಿಖರವಾಗಿ ರಾಹು-ಕೇತುಗಳ ಸಮಯ ಗಣನೆ – ಮುಹೂರ್ತದ ಪ್ರಾರಂಭದ ಅವಧಿ ಹಾಗೂ ಮುಕ್ತಾಯದ ಅವಧಿಯ ಗಣನೆ – ಇತ್ಯಾದಿಗಳೆಲ್ಲ ಇಲ್ಲಿ ಸುಲಭವಾಗಿ ಲಭ್ಯವಿವೆ. ಜನ್ಮ ದಿನಾಂಕ / ಸ್ಥಳದ ಆಧಾರದಲ್ಲಿ ಜ್ಯೋತಿಷ್ಯದ ಮಹತ್ವ. ಈ ಕನ್ನಡ ತಂತ್ರಾಂಶದಲ್ಲಿ ಕೊಟ್ಟಿರುವ ಗಣನಾ ಪದ್ಧತಿಯು ಈ ಕೆಳಕಂಡ ಅಂಶಗಳನ್ನು ಹೊಂದಿರುತ್ತದೆ. ಈ ಕನ್ನಡ ಜ್ಯೋತಿಷ್ಯ ತಂತ್ರಾಂಶವು ಜನ್ಮ ನಕ್ಷತ್ರದ ಆಧಾರದಲ್ಲಿಯೇ ಉಳಿದ ವಿವರಗಳನ್ನು ಗಣಿಸುತ್ತದೆ. ಜೊತೆಜೊತೆಗೆ ಆಯಾ ನಕ್ಷತ್ರದ ಉಳಿದ ಅಂಶಗಳನ್ನೂ ಸಹಿತವಾಗಿ ಕೊಡುತ್ತದೆ. ಉದಾಹರಣೆಗಾಗಿ- ನಕ್ಷತ್ರ ಪಾದ, ಜನ್ಮರಾಶಿ, ರಾಶಿ ದೇವತೆ, ಲಗ್ನ, ಲಗ್ನ ದೇವತೆ, ತಿಥಿ, ದಿನಮಾನ, ಜ್ಯೋತಿಷ್ಯ ಶಾಸ್ತ್ರದ ಪ್ರಕಾರವಾಗಿ ಜನ್ಮದಿನ, ಕಲಿ ಶಕೆಯ ವಿವರ, ನಕ್ಷತ್ರಾಧಿಪತಿ, ಗನ, ಯೋನಿ, ಪ್ರಾಣಿ, ಪಕ್ಷಿ, ಮರ, ಚಂದ್ರಾವಸ್ಥಾ, ಚಂದ್ರ ವೇಳೆ, ಚಂದ್ರ ಕ್ರಿಯಾ, ದತ್ತ ರಾಶಿ, ಕರಣ, ನಿತ್ಯ ಯೋಗ, ಸೂರ್ಯನ ಸ್ಥಾನ ಮಾನ, ರಾಶಿ-ನಕ್ಷತ್ರಗಳ ಸ್ಥಿತಿ-ಸ್ಥಾನ, ಅಂಗಾದಿತ್ಯದ ಸ್ಥಾನ, ಯೋಗಿ ದೃಷ್ಟಿ, ಯೋಗಿ ನಕ್ಷತ್ರ, ಯೋಗಿ-ಗ್ರಹ, ಪರ್ಯಾಯ ಯೋಗಿ, ಅವಯೋಗಿ-ನಕ್ಷತ್ರ – ಗ್ರಹ, ಆತ್ಮಕಾರಕ, ಕರ್ಕಾಂಶ, ಅಮಾತ್ಯಕಾರಕ ಲಗ್ನಾ ರೂಢ (ಪಾದ)/ ಥಾನು/ಮತ್ತು ಧನಾರೂಢ ವಿವರಗಳು ಇಲ್ಲಿ ಸುಲಭವಾಗಿ ಲಭ್ಯವಿದೆ. ಹಾಗೂ ನವಮಾಂಶದ ವಿವರಗಳನ್ನು ರೂಪಿಸಲು ಸುಲಭವಾಗುವಂತೆ ಜೋಡಿಸಲಾಗಿದೆ. ಈ ಕನ್ನಡ ಜಾತಕದ ತಂತ್ರಾಂಶದ ಜೊತೆಯಲ್ಲಿ ಒಂದು ವಿಶೇಷವಾದ ರಾಶಿ ಚಕ್ರದ ವಿವರಗಳನ್ನು ಒಳಗೊಂಡ ಪಟ್ಟಿಯನ್ನು ಕೊಡಲಾಗಿದೆ. ಅದರಲ್ಲಿ ಈ ಗ್ರಹದ ನವಾಂಶವು ವಿಪರೀತ ಗತಿಯಲ್ಲಿ ಇದೆಯೋ ಅಥವಾ ಉತ್ಕರ್ಷದಲ್ಲಿ ಇದೆಯೋ, ದುರ್ಬಲಗೊಂಡಿದೆಯೋ ಇಲ್ಲವೆ ಉಗ್ರ ಹಂತದಲ್ಲಿದೆಯೋ ಎನ್ನುವ ವಿವರಗಳನ್ನು ಒಳಗೊಂಡಿರುತ್ತದೆ. ಈ ಕನ್ನಡ ಜ್ಯೋತಿಶ್ಯದ ತಂತ್ರಾಂಶವು ಬ್ನ್ಹಾವದ ವಿವರಗಳನ್ನು ಒದಗಿಸುವ ಒಂದು ವಿವರಣಾ ಪಟ್ಟಿಯನ್ನು ಒಳಗೊಂಡಿರುತ್ತದೆ. ಇದರಲ್ಲಿ ಭಾವದ ಆರಂಭ, ಮಧ್ಯಮ ಸ್ಥಿತಿ ಮತ್ತು ಅಂತ್ಯದ ಸ್ಥಿತಿಯ ವಿವರಗಳನ್ನು ಜೊತೆಗೆ ಸಂಬಂಧಿತ ಭಾವದೊಂದಿಗೆ ಇರುವ ಗ್ರಹಗಳ ವಿವರಗಳು ಲಭ್ಯವಿವೆ. ಪ್ರತಿಯೊಂದು ಗ್ರಹದೊಂದಿಗೆ ಸಂವಾದಿಯಾಗಿರುವ ಉಪಗ್ರಹಗಳ ವಿವರಣೆಯನ್ನು ಒದಗಿಸುವ ಪಟ್ತಿಯೊಂದನ್ನು ಈ ಕನ್ನಡದ ಜಾತಕದ ತಂತ್ರಾಂಶವು ಹೊಂದಿರುತ್ತದೆ. ಚಂದ್ರ, ಶುಕ್ರ, ರಾಹು-ಕೇತು, ಮಂಗಳ ಗ್ರಹಗಳು ಸೂರ್ಯನ ರೇಖಾಂಶದೊಂದಿಗೆ ಸ್ಥಾನ ಹೊಂದಿದ್ದು, ಆ ಮೂಲಕವೇ ಅವುಗಳ ಸ್ಥಾನ ಮೌಲುಅವನ್ನು ನಿಗದಿಗೊಳಿಸಲಾಗಿದೆ. ಈ ಗ್ರಹಗಳ ಧೂಮಾದಿ ಬಳಗದ ವಿಷಯವಾಗಿ, ಅವುಗಳ ಗಣನಾ ಪದ್ಧತಿಯ ವಿವರಗಳನ್ನು ಒಳಗೊಂಡ ವಿವರಣಾ ಪಟ್ಟಿಯು ಇಲ್ಲಿ ಲಭ್ಯವಿದೆ. ಈ ಉಪಗ್ರಹಗಳ ರೇಖಾಂಶವನ್ನು ಸಹಿತ ಇಲ್ಲಿ ಪರಿಗಣಿಸಲಾಗಿದೆ. ಮತ್ತು ಇದು ಸುಲಭವಾಗಿ ಗ್ರಾಹ್ಯವಾಗುವಂತೆ ಗಣಿಸಿ, ಆಯ್ಕೆ ಮಾಡಿಕೊಳ್ಳಲು ಅನುಕೂಲಕರವಾಗುವಂತೆಯೇ ವಿವರಣಾ ಪಟ್ಟಿಯಲ್ಲಿ ನೀಡಲಾಗಿದೆ. ಇಲ್ಲಿ ಉಪಗ್ರಹಗಳ ನಕ್ಷತ್ರಾಧಿಪತಿ, ಉಪದೇವತೆ, ಈ ಉಪದೇವತೆಯ ಅಧೀನದಲ್ಲಿರುವ ದೇವತೆಗಳಸ್ ವಿವರಗಳನ್ನೂ ಸಹಿತ ನೀಡಲಾಗಿದೆ. ಉಪಗ್ರಹಗಳ ರಾಶಿಚಕ್ರವನ್ನೂ ಸಹಿತ ರೂಪಿಸಲಾಗಿದ್ದು ಅದೂ ಸಹಿತ ಇಲ್ಲಿ ಲಭ್ಯವಿದೆ. ಈ ಅಸ್ಟ್ರೋಪ್ಯಾಕ ಕನ್ನಡ ಜಾತಕ ತಂತ್ರಾಂಶವು ಷೋಡಶ ವರ್ಗದ ಮೌಲ್ಯವನ್ನು ಗಣಿಸುತ್ತಿದ್ದು, ಅದರ ಸಧ್ಯದ ಸ್ಥಿತಿಯನ್ನು ವಿವರಿಸಲು ಅನುಕೂಲವಾಗುವಂತೆ, ಅದರ ಎಲ್ಲ ಅಂಶಗಳನ್ನೂ ಒಳಗೊಂಡ ವಿವರಣಾ ಪಟ್ಟಿಯೊಂದನ್ನು ಕೊಡಲಾಗಿದೆ. ಈ ಅಸ್ಟ್ರೋಪ್ಯಾಕ ಕನ್ನಡ ಜೋತಿಷ್ಯ ತಂತ್ರಾಂಶವು ಷೋಢಶ ವರ್ಗದ ದೇವತೆಗಳ ವೊಷಯವನ್ನು ಒಳಗೊಂಡಿದ್ದು, ಆಯಾ ದೇವತೆಗಳನ್ನು ಆಯ್ಕೆಮಾಡಿಕೊಳ್ಳಲು ಅನುಕೂಲವಾಗುವಂತೆ ಒಂದು ವಿವರಣಾ ಪಟ್ಟಿಯನ್ನು ಕೊಡಲಾಗಿದೆ. ಈ ಅಸ್ಟ್ರೋಪ್ಯಾಕ ಕನ್ನಡ ಜೋತಿಷ್ಯ ತಂತ್ರಾಂಶವು ವರ್ಗೋತ್ತಮ ಗಣನೆಯ ವಿವರಗಳನ್ನು ಸುಲಭ ಸಾಧ್ಯವಾಗಿಸುತ್ತದೆ. ಅಸ್ಟ್ರೋಪ್ಯಾಕ ಕನ್ನಡ ಜೋತಿಷ್ಯ ತಂತ್ರಾಂಶವು ಮೌಲ್ಯಗಳನ್ನು ಗಣಿಸುತ್ತದೆ. ಸ್ವವರ್ಗದ ಹಂತ ಅಥವಾ ಉಚ್ಚವರ್ಗದ ಹಂತದಲ್ಲಿನ ಗಣನಾ ಕ್ರಮಾಂಕದ ವಿವರನೆಗಳು ಇಲ್ಲಿವೆ. ವರ್ಗ ಭೇದದ ಕುರಿತು ವಿವರಣಾ ಪಟ್ಟಿಯೂ ಲಭ್ಯವಿದೆ. ಅಸ್ಟ್ರೋಪ್ಯಾಕ ಕನ್ನಡ ಜೋತಿಷ್ಯ ತಂತ್ರಾಂಶವು ರಾಶಿಚಕ್ರ, ಹೋರಾಚಕ್ರ , ದ್ರೆಕ್ಕನ ವಿವರ, ಚತುರ್ಠಾಂಶ ಗಣನ , ಸಪ್ತಮಾಂಶ ಗಣನ, ನವಮಾಂಶ ಗಣನ, ದಶಮಾಂಶ ಗಣನ, ದ್ವಾದಶಾಂಶ ವಿವರ, ಶೋಢಶಾಂಶ ವಿವರ, ವಿಶಾಂಶ ವಿವರಗಳು, ಚತುರ್ವಿಶಾಂಶ ವಿವರ, ಭಾಂಶ, ತ್ರಿಶಾಂಶ ವಿವರ, ಖವೇದಾಂಶ ವಿವರ, ಅಕ್ಷವೇದಾಂಶ ವಿವರ, ಹಾಗೂ ಷಷ್ಠಿಯಾಂಶ ವಿವರಗಳ ಪಟ್ಟಿಯನ್ನು ಹೊಂದಿರುತ್ತದೆ. ಪ್ರತಿಯೊಂದು ದಶಾ ಅವಧಿಯಲ್ಲಿ ಪ್ರತಿಯೊಂದು ಭುಕ್ತಿಯ ಆರಂಭ ಹಾಗೂ ಅಂತ್ಯದ ವಿವರಗಳನ್ನು ವಿವರವಾಗಿ ಇಲ್ಲಿ ಪಟ್ಟಿ ಮಾಡಿ ಕೊಡಲಾಗಿದೆ. ಪ್ರತಿಯೊಂದು ಭುಕ್ತಿಯಲ್ಲಿ (ಅಪಹಾರದಲ್ಲಿ) ಬರುವ ಪರ್ಯಾಂತರ ದಶಾದ ಆರಂಭ ಹಾಗೂ ಅಂತ್ಯದ ವಿವರಗಲ್ಳನ್ನು ಈ ಅಸ್ಟ್ರೋಪ್ಯಾಕ ಕನ್ನಡ ಜೋತಿಷ್ಯ ತಂತ್ರಾಂಶವು ಒಳಗೊಂಡಿರುತ್ತದೆ. ಅಸ್ಟ್ರೋಪ್ಯಾಕ ಕನ್ನಡ ಜೋತಿಷ್ಯ ತಂತ್ರಾಂಶವು ಅಷ್ಟಾವಕ್ರದ ವಿವರಗಳನ್ನು ಒಳಗೊಂಡ ಒಂದು ಪಟ್ಟಿಯನ್ನು ಹೊಂದಿರುತ್ತದೆ. ಅದರಲ್ಲಿ ಚಂದ್ರ ಅಷ್ಟಾವಕ್ರ, ಸೂರ್ಯ ಅಷ್ಟಾವಕ್ರ, ಬುಧ ಅಷ್ಟಾವಕ್ರ, ಶುಕ್ರ ಅಷ್ಟಾವಕ್ರ, ಕುಜ ಅಷ್ಟಾವಕ್ರ, ಗುರು ಅಷ್ಟಾವಕ್ರ, ಶನಿ ಅಷ್ಟಾವಕ್ರ ಹಾಗೂ ಸರ್ವ ಅಷ್ಟಾವಕ್ರದ ಗಣನೆಯ ವಿವರಗಳನ್ನು ಒದಗಿಸುವ ವಿವರಣಾ ಪಟ್ಟಿ ಇದೆ. ಪ್ರತಿಯೊಂದು ಗ್ರಹ ಮುಕ್ತಿಯ ವಿವರದಲ್ಲಿ ಆ ಗ್ರಹದ ಭಾವಾಧಿಪತಿ ಗ್ರಹದ ಯೋಗ, ಗ್ರಹದ ಯೋಗ, ಗ್ರಹಗಳ ಸಂಬಂಧ, ಗ್ರಹದ ಸ್ಥಾನದ ವಿವರಗಳು, ಅನುಕೂಲಕಾರಕ ಗ್ರಹಗಳು ಹಾಗೂ ತೊಂದರೆ ನೀಡುವ ಗ್ರಹಗಳು ಅವುಗಳ ಪರಿಣಾಮ, ಗ್ರಹ ಮೈತ್ರಿಯ ವಿವರಗಳು, ಷಷ್ಟಾಂಶದಲ್ಲಿ ಧೃಕ್-ಬಲದ ವಿವರಗಳು, ಷಡ್ಬಲದ ಪಟ್ಟಿ, ಭಾವಧೃಕ ಬಲದ ಪಟ್ಟಿ, ಕುಜದೋಷದ ಪರೀಕ್ಷೆ,, ಮೌಧ್ಯಂ, ಗ್ರಹಗಳ ಯುತಿ ಮತ್ತು ಗ್ರಹಾವಸ್ಥೆಯ ವಿವರಗಳೆಲ್ಲ ಈ ತಂತ್ರಾಂಶದಲ್ಲಿ ಲಭ್ಯವಿದೆ. ಅಸ್ಟ್ರೋಪ್ಯಾಕ ಕನ್ನಡ ಜೋತಿಷ್ಯ ತಂತ್ರಾಂಶದಲ್ಲಿ ವಿಂಶೋತ್ತರೆ ದಶ ಅವಧಿಯ ಸಂಕ್ಷಿಪ್ತ ವಿವರಣೆಗಳನ್ನು ಒದಗಿಸಲಾಗಿದೆ. ಗ್ರಹಗಳ ಸುಲಗ್ನತೆಯ ಮೂಲಕ ಲಭ್ಯವಾಗುವ ವಿಶೇಷ ಯೋಗಗಳ ಕುರಿತು, ಅವುಗಳನ್ನು ಜಾತಕದಲ್ಲಿ ಗುರುತಿಸುವ ಮತ್ತು ಅದರ ಪರಿಣಾಮವನ್ನು ವಿವರಿಸುವ ಒಂದು ವಿವರಣಾ ಪಟ್ಟಿಯೂ ಇಲ್ಲಿ ಲಭ್ಯವಿದೆ. ಯೋಗವನ್ನು ಪರಿಗಣಿಸುವಲ್ಲಿ ಹಾಗೂ ಇಂತಹ ಯೋಗವನ್ನು ನಿರ್ಧರಿಸುವಲ್ಲಿ ಗ್ರಹಗಳ ಸಂಯೋಗದ ವಿವರಣೆಗಳೂ ಸಹಿತ ಇಲ್ಲಿ ಸುಲಭವಾಗಿ ಲಭ್ಯವಾಗುವಂತೆ ತಂತ್ರಾಂಶವನ್ನು ರೂಪಿಸಲಾಗಿದೆ.